You are bidding on our 16ft Fletcher Arrow, (not 14ft). It has a powerful 85hp Yamaha engine that is very capable of towing skiers and toys etc. Will do in excess of 40 knots. We have used it mainly for wakeboarding. Over the last few years we have done a fair bit of work on her including the following: Lower engine rebuild costing (£800 at local marine garage) Fitted new carpet Fitted two new marine seats Fitted new jockey wheel (never been used) Fitted two new wheel bearings. Replaced impellor Replaced woodruff key Fitted fishfinder (with depth indicator) Fitted bilge pump It comes complete with everything you need to put to sea. Included are the following: Boat. 30 Litre removable fuel tank ( 50:1 mix) including measuring jug to measure marine oil for mixing with petrol. Steering wheel and cables Spare marine oil. Working speedometer, rev counter (not working) and radio (not connected) Battery. Storage compartment. Anchor and plenty of rope. A cover to keep it dry. Engine – Starts first time and is very fast, however it has a manual tilt and trim control. Has both forward and reverse gears. 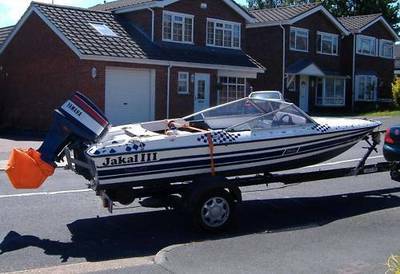 A self-printed boat manual Trailer – This has to be totally immersed in the water in order to launch. We tie a rope to the trailer to put it in the water without having to get the car wet. It has always been washed with fresh water when finished. Has a good hand winch fitted. Tow plate with lights and indicators. Wheel lock for trailer. Spare Jockey wheel. Spare tyre. Two fenders. British seagull spare engine with bracket fitted to rear of boat. We have not had her out on the water this year due to a new arrival in the family but we fired her up in April and she was humming beautifully. Would benefit from a service prior to getting on the water. For a video of her running last year in Southampton water please click on the link below: http://www.youtube.com/watch?v=TJyUTMeEDrs Payment required in cash on collection. Any serious offers welcome. PLEASE PLEASE PLEASE ASK ANY QUESTIONS YOU HAVE ABOUT THE ITEM BEFORE YOU BID. I DONT MIND WHAT THEY ARE JUST DO IT BEFORE YOU BID. DO NOT BID AND THEN TRY TO NEGOTIATE PRICE, DELIVERY ETC. I HAVE NOW HAD TO RELIST THIS TWICE BECAUSE PEOPLE DO NOT UNDERSTAND HOW EBAY WORKS!!! We have had some serious fun on this boat over the last three years. All you have to supply is the tow bar on your car with a spare number plate and you are ready to go. Joe Added 08.08.13 Hi, to the 45 + watchers. Please keep all of your offers coming because some of you are getting very close to my minimum price. Please note that if a bid is made then I will be letting the auction run its course now. BW, Joe.